What is the distinguishing element or feature that is noticeable in your custom built home? Generally custom built homes are meant to standout. They are statement making. If there isn’t anything that is outstanding about your “custom built home” then that is just a simple home – a home with nothing special. How do you make your custom built home standout? That is a more probable question for any high end home owner. The simple answer to this rather complex question is – work on your home’s floor design. Flooring offers an opportunity for you to make a bold statement. It is also a great avenue which can be used to add personality into your living space. The elaborate Spanish marble floor design is spot on! This is a perfectly designed product for your high end custom built home. Crafted from a stunning Spanish marble, quarry near Novelda, Spain, this masterpiece displays some white crystals and veins of white and clear calcite. The beauty, maintainability and durability of this rock is not adversely affected by water. 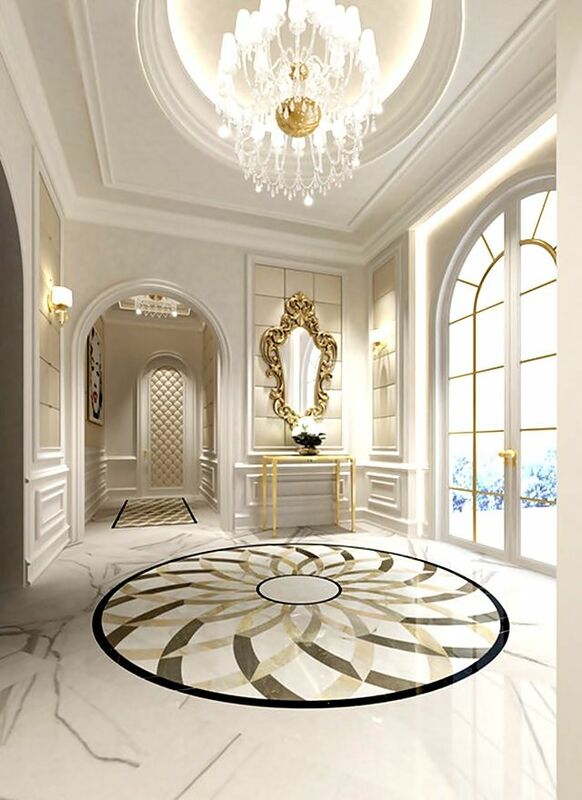 As the name of the design suggests, this is an elaborately designed marble floor. The elaborate design is created to exude elegance and class. However, the Spanish marble used on its own is classy enough. If this Luxury Marble Floor Designs won’t give your home that deservingly high end cozy and comfortable aura, then nothing will. The Luxury Marble Floor Designs couldn’t be complete with the polished finish. This stylish finish gives you a smooth surface which is also shinny. This Luxury Marble Floor Designs in Spanish marble are in three different colors beautifully combined together. Dark emperador is used to create a circular border on the design with light emperador and white tones used to create some magnificent patterns. Outside the huge circular border the design is adorned in spectacular white. All the pieces are beautifully brought together to create a cohesive masterpiece that is a pillar of peace and tranquility. This floor design gives you style and quality at the best price for your luxury home. To help extend the durability of the floor design it is recommended that it be sealed. To ensure that you get a product that is uniquely yours, the design can be altered in a number of ways including sculpturing it from any other type of marble you choose. To learn more about the elaborate Spanish marble floor design, please call us at 1-888-272-0630. Posted 4 years, 7 months ago at 12:21 am.